To accommodate its explosive growth, McLean Bible Church purchased a 43-acre site that included a 280,000 square foot office and warehouse building. They asked Helbing Lipp Recny Architects to develop a master plan to move their congregation to the new facility. The master plan consisted of converting part of the existing warehouse to a worship space, renovating the rest of the complex into classroom, office and gathering spaces, and, finally, adding a 3500 seat worship center to the front of the existing building. A 2500 car parking garage was also included. After the master plan was developed, Helbing Lipp Recny Architects designed the first phase, which required the church to share the building with the former owner, now a tenant. 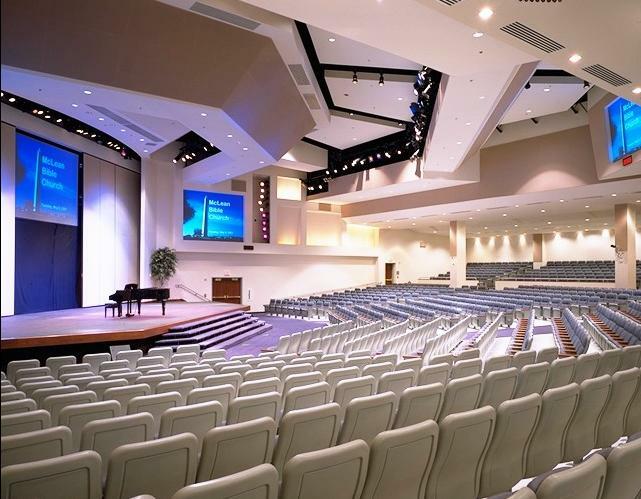 The roof was raised on part of the lower level warehouse, columns removed, and a new 1150 seat worship center was designed, with state of the art audio/video systems. (It is now called the Smith Center.) The rest of the lower level warehouse was renovated into a large narthex/foyer, nursery, classrooms, and other smaller meeting spaces. The first half of the parking garage was built as well. This project became the springboard for the church to develop the rest of the property in future years.